"Something that puzzles and annoys me which you might take look at when the opportunity arises, is the departure times and inverse synchronisation to train arrival times of the 151 bus route during evening rush hour. I’ll explain. I have a notion that perhaps the buses leave deliberately when a train pulls into the station rather than waiting 2 or minutes for the passengers to climb over the bridge and board. It sounds crazy doesn’t it, but it seems to happen so frequently during the late evening rush hour that the train arrives and just as we’re getting off the first carriage and briskly walking under (was over) the bridge the bus turns on its heels and departs. It’s almost as if there’s a game amongst the drivers to take as few passengers as possible, call me paranoid if you wish! Of course if a terminating bus arrives then the first has to depart as there is space for only one bus, but that’s not what I’m talking about. It’s the times when only one bus is there, and it would surely make huge sense that if a train arrives at the time when the bus driver is preparing to depart that he waits 2 minutes to collect the passengers, after all that is the purpose of the job! In fact if LT could synchronise the bus departure timetable to 5 mins after the train arrival time then they’d be close to providing a service! 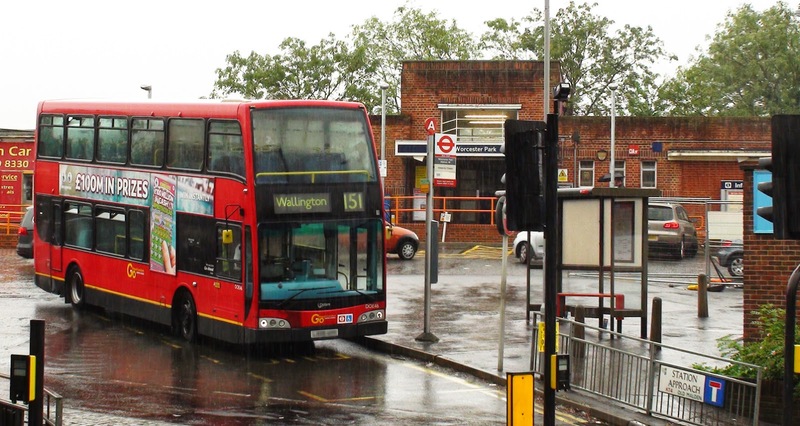 And another part of the game, when there are people standing at the corner wondering whether a 213 will come along from New Malden or whether the 151 will turn on its lights and open its doors there is another opportunity to perform the departure so quickly that there isn’t chance for passengers to cross the road and board. I’m not joking! There isn’t even 30 seconds between the engine starting and the lights coming on before the driver quickly scoops up passengers waiting right outside its door and driving off. It has been known for the drivers to allow passengers to board before lighting up so as to perfect the escape."